Current 2 GHz P5020 price range is from US$280 to US$340 at Freescale. US$240 to US$285 is the single-core P5010. > If the X1000 board design is reused, it might also save a lot of buck from the R&D pov. As WB_Coder said, completely different SoC with completely different pinout entails new board design from scratch. 1. The price I mentioned was for a system, you spoke of a motherboard alone. Please don't compare apples and oranges. 2. Since the X5000 isn't publicly released yet, are you *really* sure that the price you got to pay for that *motherboard* is the same as what the final end-user price will be, and not some kind of discounted "betatester" price á la the X1000 "betatester" program? You actually claim that the final prices are set? 3. Here is from the horses mouth: "As for pricing. 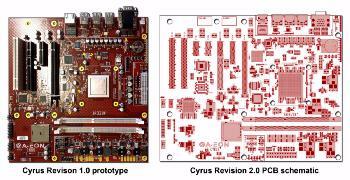 we are hoping that the new Cyrus Plus board with the P5020 will be slightly less expensive than the Nemo board, but no promises at this stage". This was in July 2013, almost two years ago, and the meter has been ticking ever since. "All-in-all the NRE costs to produce the original prototypes, revision 2 modifications and new prototypes for hardware testing burnt almost $200K in pre-funding. That is the reality of the situation. If we could sell 200,000 units that would only add one dollar to the sales price. However, if we only sold 200 that that would add US$1000 to the sales price"
So how many do they realistically predict to sell to this ever-shrinking "market" that is probably already all-saturated by the X1000? The few hundred people actually prepared to pay that kind of money for an OS4 system with that backwards level of performance already did buy the X1000. And technically speaking the X5000 won't offer much that the X1000 didn't. Most of them wont go from €3000 to €6000 just to have two machines that are almost the same. AeonKit have to distribute their R&D costs on their sales predictions. And they can't be too optimistic here, they had better be realistic if they want to see their money back. This affects the price a great deal. 5. Trevor estimated the price of the X1000 to be "north of 1500 quid" at The Vintage Computing Festival 2010. Years later, when the product actually shipped for the first time and all R&D costs during the past years was added to the picture, it landed just below £2.000 AFAIK, making it surpass the $3.000 USD mark, excluding shipment and VAT (which is rather high for EU customers). In that interview linked to above from summer 2013 he said he *hoped* the price for the X5000 would be lower than X1000. But that was also years ago, and the product has been in R&D ever since and only now reaches a commercial state. The product could very well end up being "slightly less expensive than the Nemo board", but in my view it's not entirely impossible that it will be "slightly more expensive" either. For sure it won't be 25% or even 50% of the nemo board. Which is what could have made a difference. So pampers, please don't throw groundless FUD accusations around you, especially when you are not contributing to the discussion in any meaningful way yourself. That's not very nice! If the X1000 board design is reused, it might also save a lot of buck from the R&D pov. It *isn't*! They have designed and produced several new board designs in their R&D process, from scratch, nothing re-used from the X1000. No economy of scale whatsoever. It was between 500 and 975 USD. With the merger of NXP and Freescale, the future development of Freescale's PPC products is uncertain. I, for one, will be buying an X5000 in part because it will represent an interesting stage in the development of our platforms. Only Cyrus was designed from scratch. Cyrus+ (= Cyrus Plus = Cyrus rev2) is based on Cyrus, of course, even if the slot count and formfactor are different. I don't care if it's nice or not. I wish you could convert all that A-EON and Hyperion bashing posts into some articles about MorphOS and contribute this way to the community. Repeating the same stuff over and over again gives nothing. Sorry if it's not nice again but this is the way I see it. While high end PPC G5 Mac is hard to get, I hope it gets fully supported by MorphOS during its PPC era. Since I have tested X1000 under Linux and OS4, its fast enough, but no revelation. I wish for the future it was more G5 like in CPU performance (Altivec,SATA2 on fasted HDD or SSD, FPU and memory tests are fast) or it was a Power8 mobo. But it is what it is. 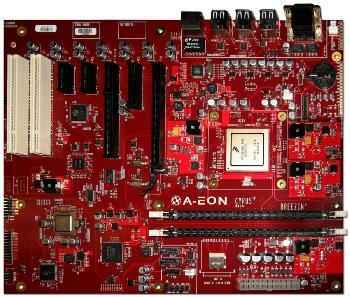 Especially under AmigaOS where most of Nemo board can`t be used, and if compared in performance to SAM460ex where it offers equal performance gain to SAM460ex price. I found it to be very usable Linux system, which doesn`t make it that much of a non-usable toy. I am saying all this, because X5000 is similar product. Its not in high end computing but in niche market of fastest available desktop PPC board. Whatever promotion and market visibility X5000 receives, there is a potential benefit for MorphOS. One in all, while I dislike way Hyperion does things, AEON seems to do things nice way. Much of what you wrote I agree to, but it _may_ be different. Thing is, we don't know much real life power of the 50x0. While the PA6T is a pretty castrated chip of low performance this may not be the case for the 50x0. The ALU is fast (three instructions/cycle), the bus is fast, many modern peripherals are integrated to the chip. If Freescale did their job well it can be actually quite an interesting chip that probably performs _different_ than the 744x or 970xx do. And yes, something like 3000 US$ is quite a lot of money, even only the half would be quite a very steep price, but depending on actual performance and state of my bank account even I can imagine scenarios where I could start thinking about buying one. Most of all: It's new and not a electric energy hog (like the G5s). My G4s are running fine still and except one harddrive I never had a hardware failure with any of my hardware ( C=, Phase5, bplan & Apple to name the ppc and 68k ones), but they are about 10 years old now. It's not granted they will run 10 more years. Sure, if there's a failure i can head over to ebay and get another machine for pocket money (would probably do so anyway), but that hardware is aging, too. Hence, new hardware has a certain appeal. Dunno though how much $$$ this appeal may be worth and I doubt it will do the math for me. But there are quite some ppl whose wallet opens quicker than mine. Hence, i wouldn't say it's a given that X5000 with MorphOS will be a "failure", but I also wouldn't bet money on a "success". I understand that they are hard to find where you live, but it's pretty easy over here in Sweden. The other day I even found a G5 @ 2.7 GHz (without HDD) for 30€ (!). I'm bummed that I didn't buy it (even though I don't need it). Yes, they are cheap here too. I purchased a 2.7 for about $50. If it auctions with no reserve, possible. Some years back I remember seeing a Sam440 w/OS4 on eBay go for ~$30(USD). I can't imagine the seller was all to thrilled. Haven't seen one sell with no reserve auction since (but haven't looked honestly). I thought you sold (traded for SAM460) your X1000 to some artist user who makes posters, or website designs? > who makes posters, or website designs? Vox clarified later that this was no sale or trade but a case of mutual borrowing/lending. The way I see it there is zero benefit for MorphOS for neither Sam 460 or X5000 (other than the said improvements of Quark that happened because of this and new graphics drivers that later can be used on x86). They are too limited, too expensive, have too few users. As a "HW path forward" for MorphOS (and OS4) they are a dead-end (the same goes for OS4 of course). I dont think there are going to be many users buying new AmigaOne to run MorphOS only but at least OS4 users have now chance to get MorphOS for their hardware and MorphOS users have chance to buy new hardware. It is not benefit for MorphOS per se but benefit to users. Radeon and possible other PCI-E drivers aren`t that little, its a huge leap forward. As long as MorphOS is PPC, its good to have more mobos supported and it will be good to see MorphOS offered again in shops. No one is saying that is definite end or major benefit. Other then that I might think X5000 (maybe X1000 too) could be used to develop PPC64 (general 64-bit version) and multicore support. So, there is still some work to do. In perfect future MorphOS 4 would be offered both AMD64 and PPC32/64. Likewise, its more benefit to current and possible SAM/x5000 owners, but there is also some benefit of having them on MorphOS side. Could also be done with supported G5 Macs. Could also be done with supported dual-G4 and dual-G5 Macs. The path to another ISA can start here with further development of the PPC variant. Sorry grandma, I'm in no hurry to ditch the PPC. And, as I have said, I will be buying an X5000. Well on the corporate sites (AO/AWN/Amigans), once again direct comparisons are being considered "trolling" and "FUD". I doubt many benchmarks will be allowed once MorphOS is available for the two AmigaOne systems. Yes, they don't care for comparisons. Then there is those few that want to make MorphOS look like OS4 (which I really don't get as Ambient is, to me, a big improvement). What it comes down to is OS4 is basically a PPC port of OS3.1, while MorphOS is a new operating system with OS3.1 API compatibility. They aren't really as similar as they would appear. Well on the corporate sites (AO/AWN/Amigans), once again direct comparisons are being considered "trolling" and "FUD"